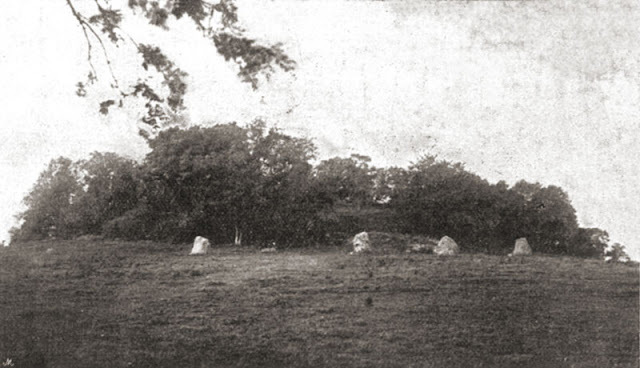 This large henge (embanked enclosure) located beside the River Boyne at Brugh na Bóinne, known on archaeological maps simply as Site P, has been identified tentatively by archaeologist Geraldine Stout as the site referred to in ancient lore as Caisel nOengussa, the Cashel of Oengus. 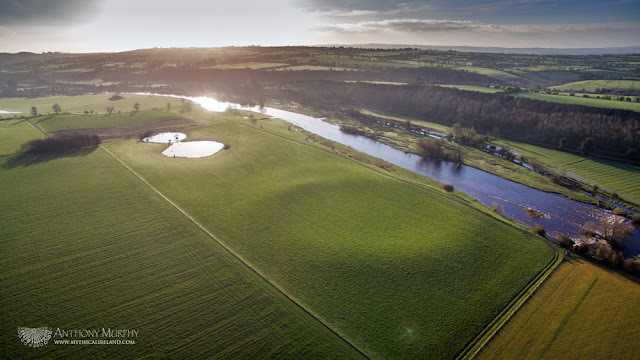 Aerial photo showing Caiseal Oengus (Site P), the double pond feature and Mound B all along the Boyne. A description of sixteen sites at the Brug na Bóinne complex is described in the Dindshenchas, a collection of middle Irish legends from around AD900-1200 that poetically describe the "lore of the landmarks". It is not known why Oengus/Anghus had a site attributed to him separately to Newgrange (called Tech Mic ind Óc and Sid i mBruig Míc ind Óc in the Dindshenchas poem Brug na Bóinde). It is just one of a number of such embanked enclosures in the area. Perhaps the most famous in the Bend of the Boyne is the Dowth Henge (Site Q) which is one of the largest in Ireland. Because of its somewhat denuded nature, Site P is best seen when the sun is low in the sky, as demonstrated by this photo taken at 7am this morning on a beautiful spring dawn. Behind the henge to the upper left is a double pond, often described as a figure-of-eight pond, which is thought might be a manmade feature. Caiseal Oengusa and the double pond attract whooper swans, which spend some of their time at these locations when they come to the Boyne Valley from Iceland to spend the winter here. Further off in the distance, behind the double pond, is Mound B, on the flood plain of the Boyne. In honour of Sheelah, whose special day is today, I've written this poem. 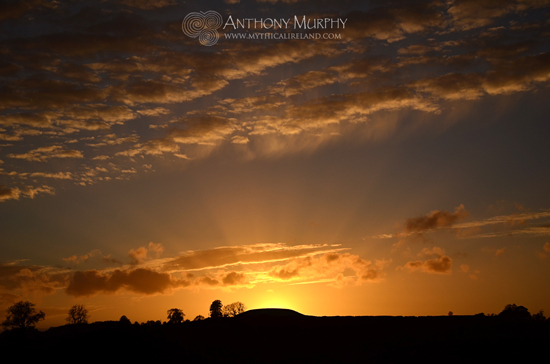 The photo is of Newgrange at sunset a couple of weeks ago. 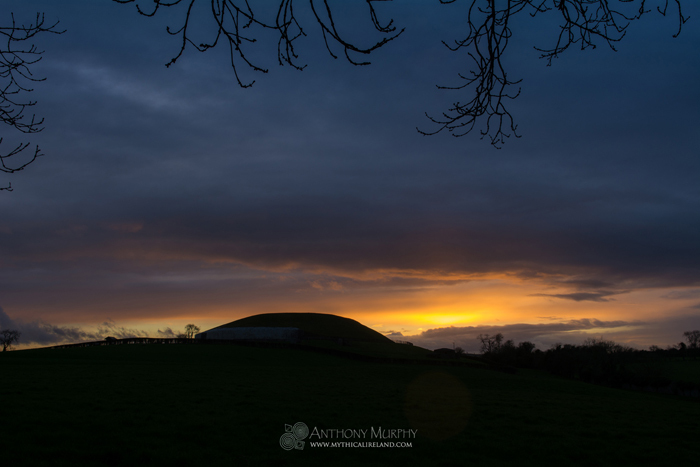 It is my 200th upload to the Newgrange gallery. Síd in Broga (Newgrange - the 'Big Sidhe!') under a red sky at sunset. Shall we go and shee? No, you cannot see the shee. The shee is for Sheelah. She is the woman who cannot be forgotten. She is the great mystery. So what is the shee? Is it a fairy palace? The shee is more than that. The shee is the great mystery. It is the untranslatable concept. her mysteries in a strange tongue. that will introduce you to her. Sheelah of the great sidhe. The symbol of the sidhe. Another aspect of sadness in relation to the megalithic monuments is the feeling of melancholy engendered by thinking about the ancestors, and the lives that they endured, and the sometimes harsh existences they lived through. And to what end? So that we can exist on this day? So that we too can endure the fullness of life, and all its agonies and all its ecstasies? I think part of the sadness relates to the temporal, and temporary, nature of our physical existences. As I wrote in Newgrange: Monument to Immortality, "we are here only for a short time". We look at the magnificent megalithic edifices, those wondrous temples of stone from the ancient world, and we stand in admiration of a society of people who created something so powerfully enduring, so permanent, in an ever-changing and ever-vanishing world. And that sums up a powerful part of the human experience on this earth. We are born. We live a short life. We die. And what do we leave behind, as a memorial of our brief existence here? 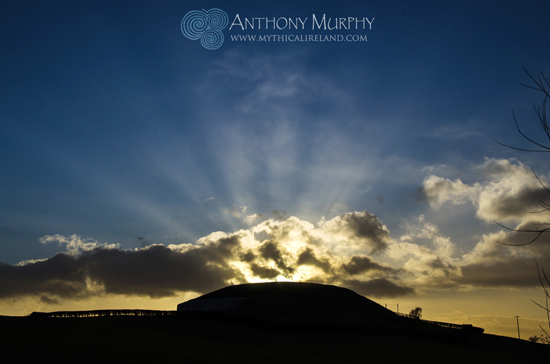 The builders of Newgrange created something powerfully enduring in an ever-changing world. 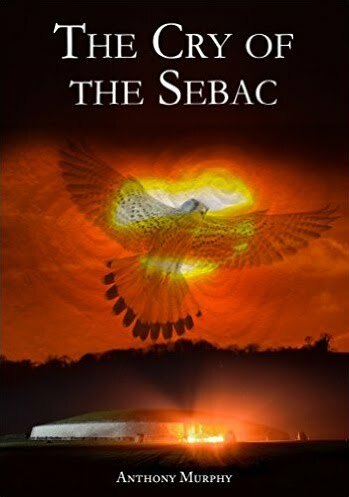 In Land of the Ever-Living Ones, I addressed the issue of ancestors in the beautiful dialogue between the sean-draoi, the wise old man, and the young boy. The sean-draoi tries to impress upon the boy that we must never forget the ancestors, because we are them and they are us. "We are the ancestors," the sean-draoi declares, to the bemusement of the young boy. "We are on a winding trail, an ancestral pathway that is much longer than any road we will ever walk in this world. It winds out of the furthest reaches of the past, and leads onwards to some unknown destiny, far off in the distant future. If we were to forget from whence this path emerged, from our own mothers and fathers of the long forgotten yesteryear, if we were to forsake our own journey along this path, would we not also be denying the magical future, the unknowable destiny that awaits our myriad descendants yet to come? Are there not a thousand, nay a million, even more, of our offspring who will look back along the path to remember us, their distant progenitors, those who continued the pilgrimage on this great path that leads back to the very dawn of time itself?" "We are the meeting point of ancestors and descendants. The track leading from the past, and the road heading off into the future, are joined, here and now, with us. We are what binds ancestors to progeny, forebears to descendants, yesterday to tomorrow. We have a very special place in the life of the world, and we must recognise and honour it, holding fast to the onerous pathway beneath our feet, and all the time remembering ancestors who have brought us to this point. Some day we will be the ancestor, lifted off this worldly trackway and brought aloft towards the heavenly realm, and although our own feet will no longer tread the sacred pathway of life, those of our children and our children’s children will, we hope, find their way on the never-ending trail from ancestor to descendant." 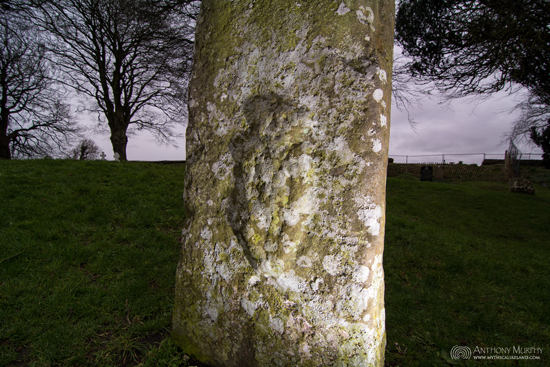 Remembering the ancestors at Dowth, Ireland from Anthony Murphy on Vimeo. Of course, all the above is predicated on the belief that "this is it", that this life is the only life, and that when we die, we are going into a grave, and we will be extinguished forever. If there is one thing that can be said about the ancient mound of Síd in Broga/Newgrange (and there are many great things that can be said about it), it's that the people who built it were keenly participating in life and its mysteries, at the same time, preparing themselves for what might lie beyond. In Newgrange: Monument to Immortality, I postulated that the design of the monument is in tune with aspects of the near death experience (NDE), with its dark tunnel leading towards the light. We might call them primitive, but our distant forebears were pragmatic about life and death. They sensed that there was something beyond this life, and aspects of this belief survived into later times in the form of stories about wondrous otherworlds and places or realms where people lived on in happiness. And so it becomes clear that the sadness that I sometimes feel at the monuments is not always one that's inherently part of those monuments, but rather a sadness that I bring from my modern world and its attendant psychosis, and its bulldozers. We see fit to destroy in order to create. We deem it normal to rip the earth asunder, because in our own shortsightedness, we think that this is all there is, so we'd better make the most of it, even if that means depriving our descendants of a hospitable planet. Despite my great love for the monuments, there are yet some hard questions that must be asked. To shy away from them would be a disingenuous act. An honest appraisal of our relation to the mounds, and the landscape, and the past, and the ancestors, requires us to remove the mask and to see ourselves as both ancestors and descendants. What would we have done, in the same situation, in the past? And what are we likely to do in the future? Does anything really change? Do we change at all? 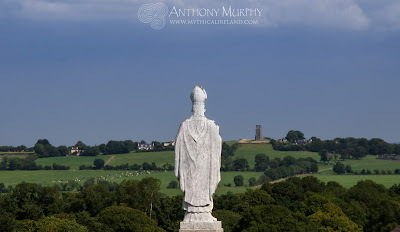 We might ask Newgrange if it should ever have been built at all. Could I even dare to suggest that, at Newgrange, I might even ask it, "should you have been built at all?" When we left the forests, and the antediluvian hunter-gatherer life of the Mesolithic, were we not beginning on this frightful march towards oblivion? Could we yet contemplate the notion that there was someone who stood watching the construction of Síd in Broga all those 50 centuries ago, who observed with bewilderment the emergence of a new phase of human madness? 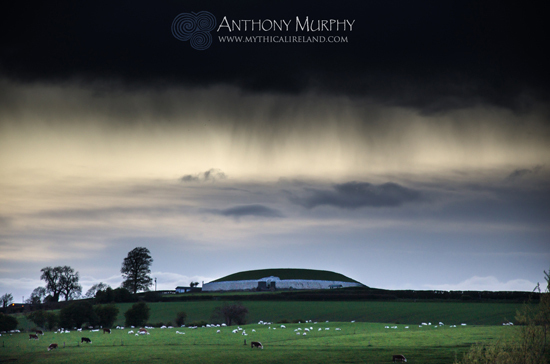 (1) Murphy, Anthony (2012), Newgrange: Monument to Immortality, p.134. (2) I should add that several times in this movie I mention the "men" who built Dowth. This is not an intentionally sexist statement, but rather a repetition of the myth about Dowth, which says that the king commanded "all the men of Erin" to build it. (3) Campbell, Joseph, Pathways to Bliss. (4) Sogyal Rinpoche (2002), The Tibetan Book of Living and Dying, p.8. Sadness. Now there's a word. A word full of power, and so appropriate for the story of the monuments, especially those that are damaged or decaying in the landscape. I've been dealing with this sadness for a long number of years. Whenever I am alone at one of the many ancient and sacred places of this land, there's always a sense of sadness. Not that I'm always sad. And not that it's always a dominant emotion. Sometimes, (quite often, in fact) I'm ecstatic. These places are capable of enrapturing me and bringing me to a state of numinous awe. But the sadness is always there, somewhere. It never fully goes away. 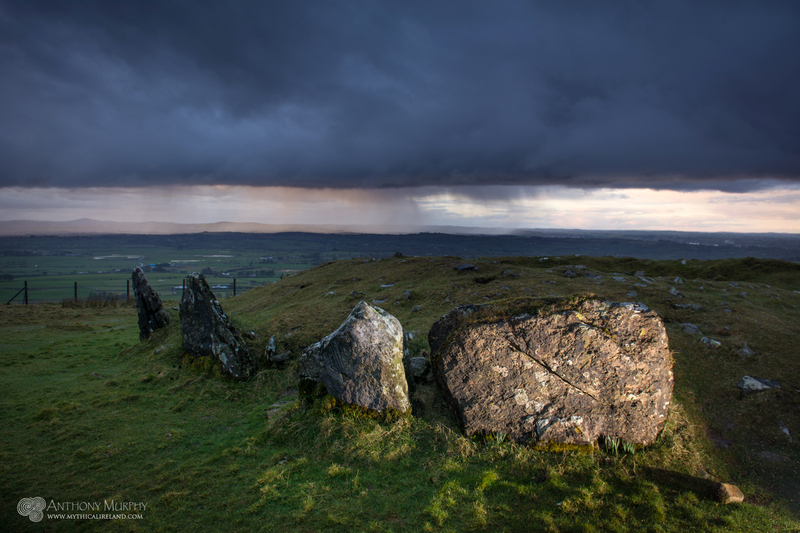 The remains of Cairn U at Loughcrew, a "lost world" which is over 5,000 years old, with storm cloud. I used to think it was just a sadness for a lost world. A lost tribe of humanity, of my ancestors. 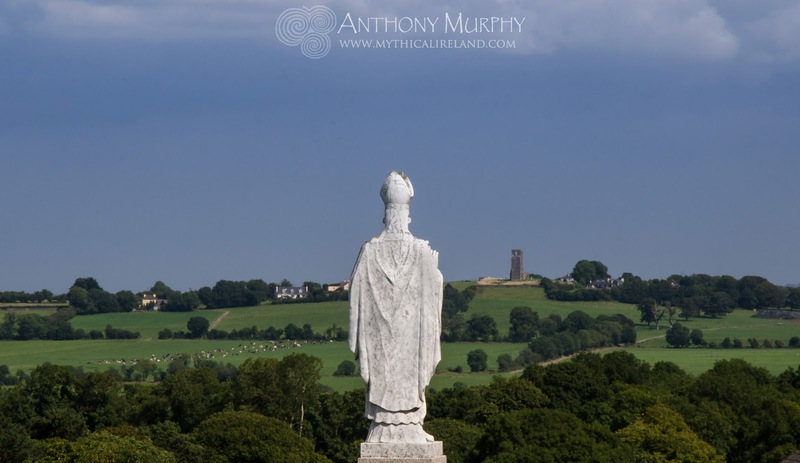 A people who lived and died in the blinking of an eye, and whose presence here would go totally unrecognised were it not for the presence across the landscape of so many of their ancient monuments and sacred structures. But then I remember when I was younger, and I'd see a bulldozer at work, ripping up the earth and making a mess of it. And I was sad then too. I was sad when the diggers came and took down all the trees that used to grow "down the back", a wild field behind the house where I grew up, a place full of briars and old ruins, the decrepit remnants of an old and forgotten urban world - a Drogheda on the Boyne that has been and gone. There, in among the thorns, was "the cave", an ancient wine or food cellar, its old ceiling inlaid with a decoration of cockle shells, set into a sandy cement that formed a rough curving, arched ceiling. Like the candlelit Newgrange of the old days, before the excavations, "the cave" was both fascinating and terrifying. It had partly collapsed at some stage, leaving a hole that we used to enter in through. While in there, in the darkness, we did not know if the whole thing was going to collapse in on top of us. Of course, that didn't stop us from going in! And one day, the bulldozers arrived and took it all away. And I was immensely sad. I have no photographs of it. All that's left of it is what I remember, and even that's not much. I was sad the day our apple tree was cut down. And I was said when, years after my siblings and I each planted a tree at the end of the garden, mine had been choked by the growth of many others, and withered away and died. The house I grew up in (left) and the view towards Laurence Gate. Photo: Google Maps. I was also confused. When I was young, in my early teens, Drogheda was a run-down place. A decaying old town, crumbling to bits. And I wanted it to be renewed, and rebuilt. And I wanted it to be bigger. And I wanted it to have the biggest port in Ireland, and the busiest railway, and the best shopping centres, and I wanted it to have a big population. That would make it important. That would make people sit up and notice my old town. And when some of that did happen, in those crazy Celtic Tiger years, I was sadder than ever. More of the green fields were ripped up. In their place was built concrete and asphalt and steel and glass and brick and slate. The land that had been green forever was maimed and scarred. And I was sad. I never realised that within me was this environmental fundamentalist, bursting to get out. I hated to see new roads being built. I hated to see the bulldozers, ripping up the sods. I hated to see concrete being poured into a green field. It made me very, very sad. And even when old, decaying, derelict and sometimes dangerous, roofless old houses or buildings were knocked, to make way for new ones, I would be sad. How do you explain that? People cannot live in derelict, roofless houses. And yet I was sad, because another part of the old world was being torn up. Of course I would rarely vocalise this urge to preserve everything, perhaps because I feared ridicule because of the apparent futility of my position. It got to the stage that I wanted to keep the old bits, and I didn't want the new bits. A generation of Drogheda people remember a part of the town - the area of James' Street, Bull Ring, and John Street, that was torn out by the metal monsters to make way for a new dual carriageway that carved its ugly pathway through one of the most ancient parts of the town. 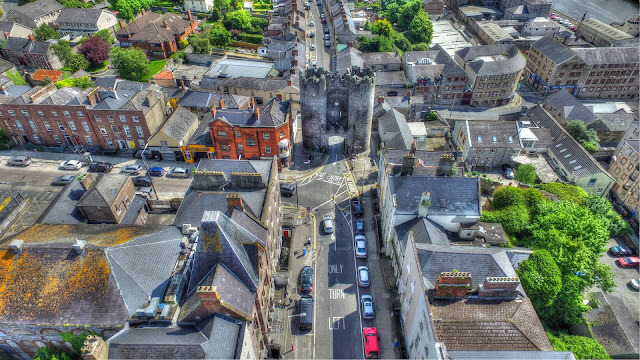 Even today, the traffic winds its way under the ancient archway of Laurence Gate, an ancient barbican, and the most impressive remnant of the walls of the town that were first erected in the 13th century. I grew up on the street that leads eastwards away from the great barbican. I passed by it, and under it, pretty much every day of my life for 20 years. And sometimes a lorry goes under that arch and clips off it, scraping it, and occasionally knocking a chunk out. There's a campaign to close it to traffic. That campaign has been running for at least three decades. The traffic still flows underneath, and the ever-present danger of a catastrophe is there. I wonder if I will wake up some day to the news that the thing has collapsed in a ruin because it has been struck by the truck of ignorance. Or maybe, to save ourselves from all that pain, we should just bulldoze it now? Aerial view of Laurence Gate. Photo: www.closethegate.org. No wonder, then, that I make my escape from the post-Tiger concretised Drogheda, out into the Boyne Valley and beyond, to visit places that are away from this unfettered craziness that we call urban civilisation. Even Newgrange was rebuilt. This is what it looked like in 1890 as depicted in George Coffey's book. I'd go to Newgrange, and I'd be sad. I'd drive to Monasterboice, and I'd be sad. I'd visit the Hill of Slane, and I'd be sad. I'd climb Loughcrew, and I'd be sad. Why was I sad? I don't know if I can explain that in one blog post, but one of the reasons I was sad was probably because I realised that, in order to build something, something else must be destroyed. In the world view of a committed environmental fanatic, Newgrange would never have been built in the first place.